In green plants, water is the hydrogen donor and it undergoes oxidation to produce oxygen. Photosynthesis occurs in two stages, viz. light reaction and dark reaction. The light reaction is light-dependent. Light energy is captured in this stage and is utilised to make the energy-storage molecules ATP and NADPH. Dark reaction is light-independent reaction. Dark reaction is utilised to capture and reduce carbon dioxide. Dark reaction doesn’t mean that it happens in the absence of light. Chloroplast is the cell organelle where photosynthesis takes place in plants and algae. A typical plant cell may contain about 10 to 100 chloroplasts. Chloroplast is enclosed by a membrane. This membrane is composed of an inner, outer and an intermediate membrane. An aqueous fluid; called stroma is present within the membrane. Stacks of thylakoids are present in the stroma. A stack is called a granum. Thylakoids are the sites of photosynthesis. A thylakoid is a flattened disc. It is bound by a membrane. 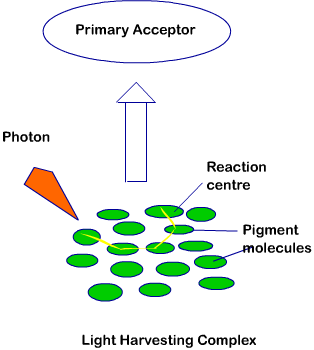 The lumen or thylakoid space is present within the membrane. The tyhlakoid membrane is the site of photosynthesis. It contains integral and peripheral membrane protein complexes. Pigments which absorb light energy are also present on the membrane. The protein complexes and the pigments form the photosystems. Chlorophyll is the main pigment to absorb light. Additionally, carotenes and xanthophylls are also used by plants to absorb light energy. Algae also use chlorophyll for absorbing light. These pigments are embedded in plants and algae in special antenna-proteins. The pigments are ordered in these proteins so that they can work in perfect coordination. Such a protein is also called a light-harvesting complex. All the cells in the green parts of a plant have chloroplasts but most of the energy is captured in the leaves. The mesophyll of the leaf can contain between 450,000 and 800,000 chloroplasts for every square millimeter of leaf. The surface of the leaf is uniformly coated with a water-resistant waxy cuticle which protects the leaf from excess evaporation of water. It also decreases the absorption of ultraviolet or blue light to reduce heating. The epidermal layer of the leaf is transparent. It allows light to pass through to the palisade mesophyll cells where most of the photosynthesis takes place. The light reaction is also called the Photochemical phase. It includes light absorption, water splitting, oxygen release and the formation of high-energy chemical intermediates (ATP and NADPH). Many complexes are involved in the process. The pigments are organized into two discrete photochemical light harvesting complexes (LHC) within the Photosystem I (PS I) and Photosystem II (PS II). The photosystems are named in the sequence of their discovery and it has nothing to do with their function during the light reaction. Each photosystem has all the pigments; except one molecule of chlorophyll a. The single chlorophyll a molecule forms the reaction centre. In PS I the reaction centre chlorophyll a has an absorption peak at 700 nm, hence it is called PS700. In PS II the absorption maxima is at 680 nm and hence it is called PS680.